Whe­ther for cou­ples, fami­lies, sin­gle tra­vel­lers or long-term guests: with our wide selec­tion of room types, we have a good opti­on for your bud­get for every city trip to Con­stan­ce. 32 rooms and apart­ments con­vin­ce with the charm of neo­clas­si­cal archi­tec­tu­re, the restrai­ned clas­si­cism and the focus on prac­ti­cal prac­ti­ca­li­ty. 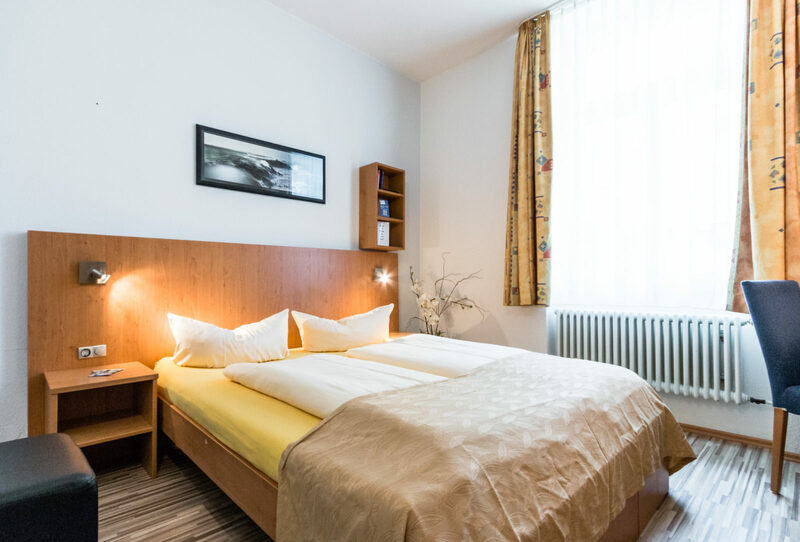 All rooms are equip­ped with flat screen TV, WLAN, ref­ri­gera­tor, desk, safe, USB char­ging sta­ti­ons, hair­dry­er and more – so our stan­dard cate­go­ry rooms alrea­dy offer a high level of com­fort. If you are tra­vel­ling with your fami­ly: Baby cots are free if avail­ab­le, as are child­ren up to 6 years of age in their par­ents’ bed. Extra beds for child­ren are avail­ab­le, pri­ces accord­ing to the sea­son. You can also bring pets on request. 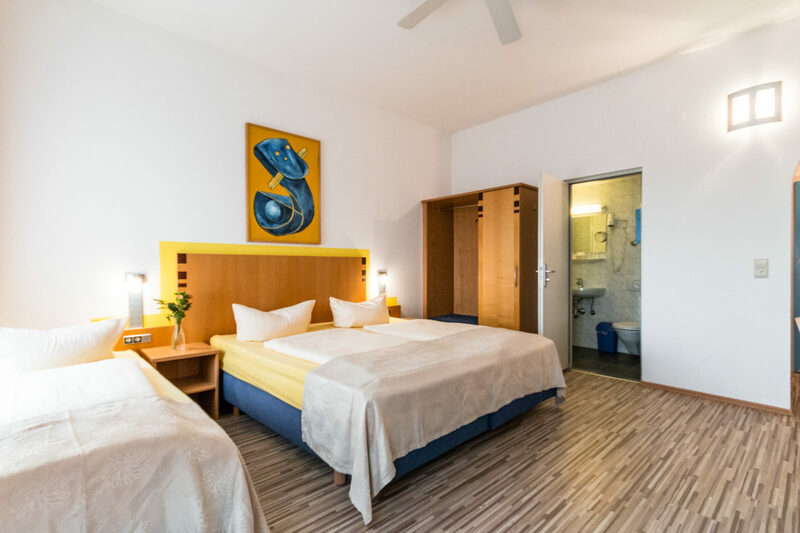 Once you have deci­ded on a type of room, sim­ply click on „Book a room” and enter your tra­vel details to check avai­la­bi­li­ty and pri­ces and reser­ve your stay with us. Of cour­se you book with us at the best pri­ce. In our sin­gle rooms to the city side sin­gle tra­vel­lers will find a rest­ful sleep on approx. 14 m² and a well-equip­ped accom­mo­da­ti­on. 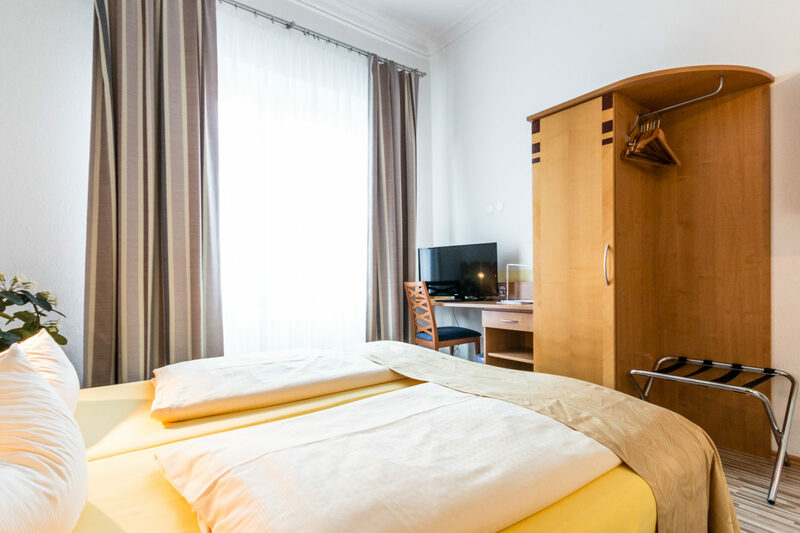 In our cosy dou­ble rooms on the city and lake side you com­bi­ne good recrea­ti­on on 14m² and imme­dia­te pro­xi­mi­ty to the old town of Con­stan­ce. 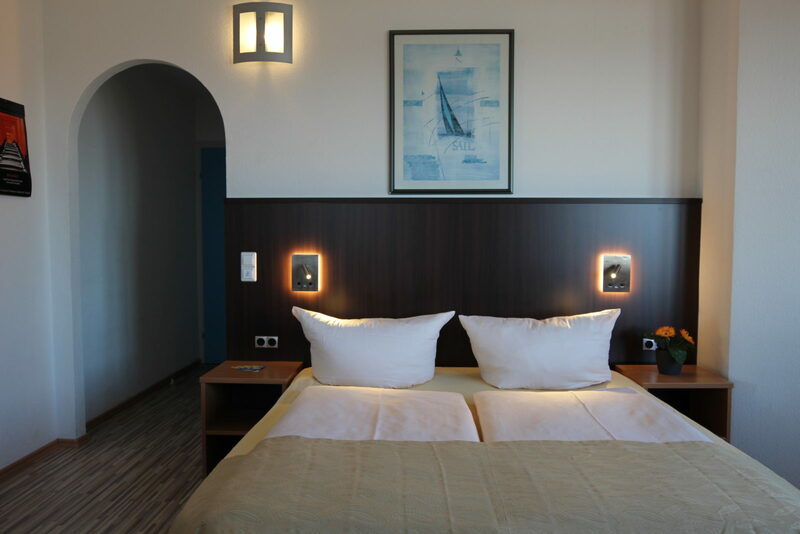 Enjoy your stay in our modern rooms of 20m². Some rooms have a direct view of Lake Con­stan­ce. Tre­at yours­elf to the luxu­rious com­fort of our 24m² lar­ge rooms. The view over Lake Con­stan­ce awaits you on the boo­ka­ble lake side – and in good wea­ther even into the Alps. On the 1st floor (lift avail­ab­le) we offer you a 24m² room with ste­p­less access near the recep­ti­on. The bathroom is equip­ped accord­in­gly and offers a move­ment sur­face over 1,50m x 1,50m. In the room you will also find a por­ta­ble emer­gen­cy bell. From 70,- € depen­ding on the sea­son. Our 24m² trip­le rooms on the lake side are ide­al for young fami­lies or groups. On request you can book a cup­board kit­chen / kit­chenet­te. In two sepa­ra­te bedrooms you live on 32m². Ide­al for fami­lies or for tho­se who are hap­py about the loca­ti­on on the lakesi­de. From 125,- € depen­ding on the sea­son. Our long-term apart­ments are equip­ped with a kit­chen cup­board / kit­chenet­te and are ide­al for busi­ness tra­vel­lers, fit­ters or holi­day guests. The pri­ce depends on the length of stay. This is pos­si­ble from 7 nights. Plea­se ask us with your con­cre­te tra­vel dates. 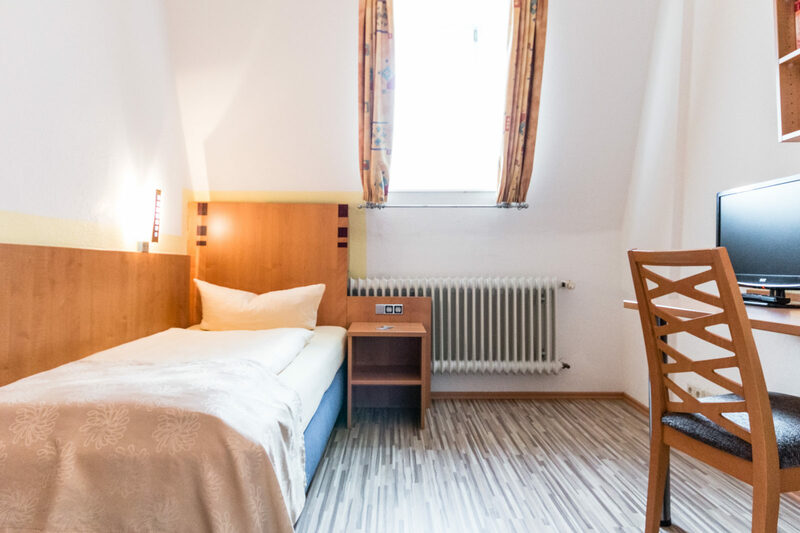 The Gästehaus Centro is a hotel for tra­velers who want to dis­co­ver the city of Kon­stanz. Our job is to make sure you have a good night’s sleep, a good bre­ak­fast, deli­cious cof­fee and a smi­le on your face. Lea­ve our hotel and you are right in the midd­le of the old town – just a few minu­tes of wal­king from our attrac­tions, char­ming insi­der tips , the har­bor and the train­sta­ti­on. Book your stay in Con­stan­ce here – with best pri­ce gua­ran­tee.